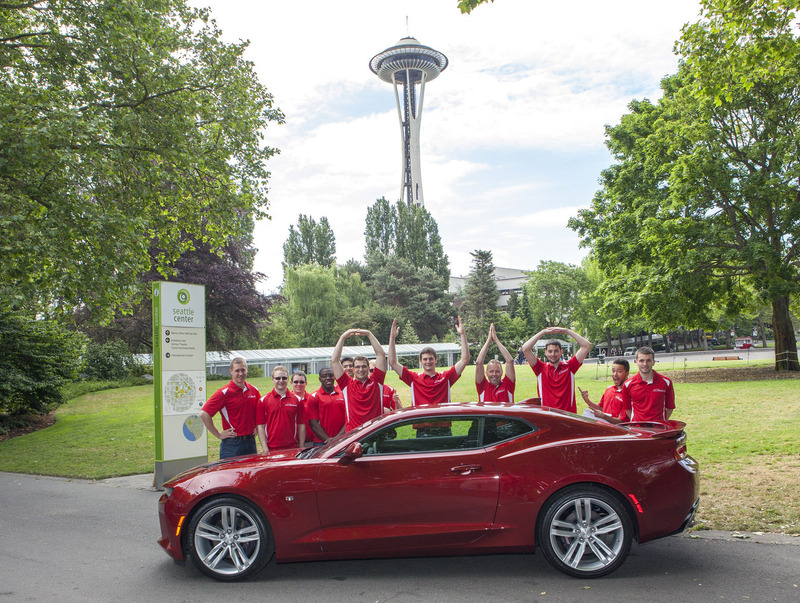 The Ohio State University team was named the overall winner for Year One of the EcoCAR 3 competition, a four-year collegiate engineering program that gives students the chance to design, build and demonstrate cutting-edge, eco-friendly automotive technologies in the 2016 Chevrolet Camaro. The win marks the second victory in row for the Ohio State team, which last year claimed the top prize in the three-year EcoCAR 2: Plugging In to the Future competition to create a more efficient Chevrolet Malibu. The Buckeyes showed all-around excellence in Year One, competition organizers announced, demonstrating a highly mature software development process, and as a result received a trophy, $10,000 and repeat winner bragging rights. Ohio State’s 40-member student team earned a total of 937 points out of 1,000 and also took first place in the communications and project management categories. Judges were impressed by their efforts in identifying a target market for their vehicle and branding strategy, including a memorable tagline: "Classic.Recharged." Sixteen North American university teams gathered in Seattle for five days of judged competition. Throughout the events, teams put their designs to the test, giving presentations to industry and government professionals based on their mechanical, electrical, control strategies, project initiation approval, outreach, project management, trade show display and innovation topics. The first year of EcoCAR 3 emphasized the use of math-based design tools and simulation techniques for designing a successful vehicle architecture that reduces energy consumption, well-to-wheel greenhouse gas emissions and tailpipe emissions. Each team will receive their 2016 Camaro this fall. In years two, three and four, students will rebuild the vehicle based on their new architecture and continue to refine, test and improve the vehicle's operation. "Without having the full picture of the attributes of the new 2016 Camaro, the students from The Ohio State University were able to develop a strategy that can turn this high-performance vehicle into a cutting-edge, eco-friendly alternative," said Chevrolet Camaro Vehicle Chief Engineer Al Oppenheiser. "Not only does the 2016 Camaro's leaner, stiffer platform provide an optimal base vehicle for these students to achieve their powertrain goals, the exterior of the vehicle was designed to specifically enhance efficiency." Ohio State entered the final week of competitions with an eight-point lead over Virginia Tech based on deliverables due throughout the year. By the time the final scores were tallied, Ohio State had a 42 point lead over the second place finisher. The Buckeyes placed in the top five for 27 of 31 scored events, including six first place and three second place finishes. Established by the U.S. Department of Energy and General Motors Co., and managed by Argonne National Laboratory, EcoCAR 3 is the latest Advanced Vehicle Technology Competition (AVTC) aimed at developing the next generation of automotive leaders. The four-year program concludes summer 2018. Be part of the Ohio State's EcoCAR team. Support a second national championship via give.osu.edu/ecocar.